A thermal imaging, thermal camera, thermal imaging camera working distance is mainly see lens focus, detector pixel pitch and exactly environmental condition, in really environment, sometime need also see thermal device sensitivity. Working distance theory data common count way have many types, such as NATO standard and Johnson’s criteria. NATO standard identification, recognition and detection distance relation is about 1:2:6, or identification need 6 lp/target, recognition need 3 lp/target and detection need 1 lp/target. Johnson’s criteria identification, recognition and detection distance relation is about 1:2:8, or identification need 12 pixels, recogniztion need 6 pixels and detection need 1.5 pixels. In really environment, normal identification, recognition and detection distance relation is only about 1:2:3, or identification need 6 lp/target, recognition need 3 lp/target and detection need 2 lp/target; or identification need 12 pixels, recognition need 6 pixels and detection need about 3 - 5 pixels. By see below some picture, then very easy understand. 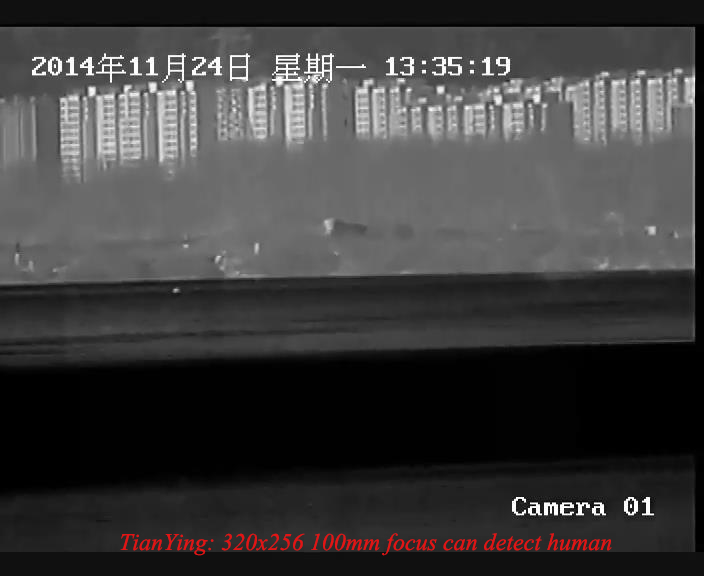 This is why 100mm focus 320x256/640x512 17microns thermal camera detect human about 1200m-1500m, recognize human about 800m-1000m and identify human about 400m-500m. 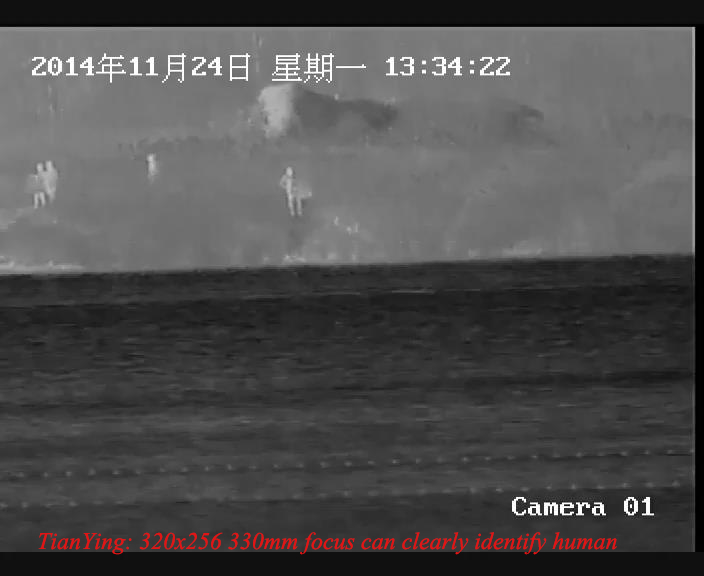 or this is why 300mm focus 640x512 15microns thermal camera detect human about 4km-5km, recognize human about 2.6km-3.3km, identify human about 1.3km-1.6km. 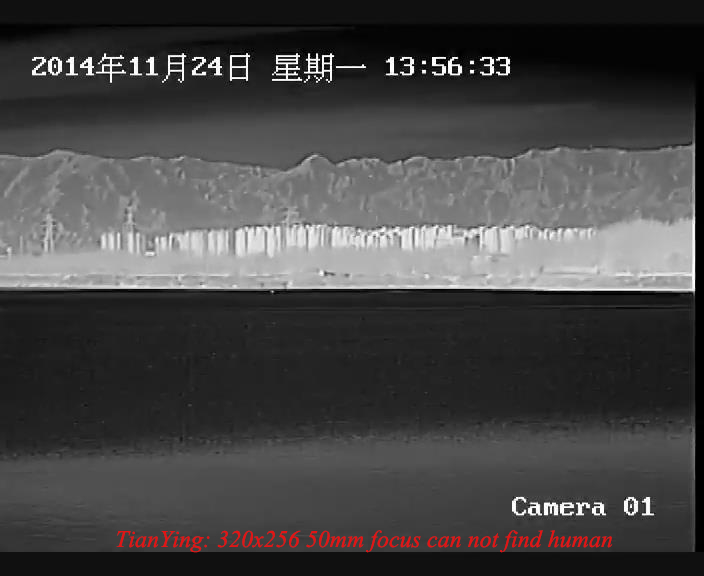 If lens is long focus and target is week infrared radiation, then distance data will decline, sometime distance data will decline rapidly, this is why 750mm, 1000mm and 1200mm focus 640x512 cooled thermal cameras detect range that is approx. 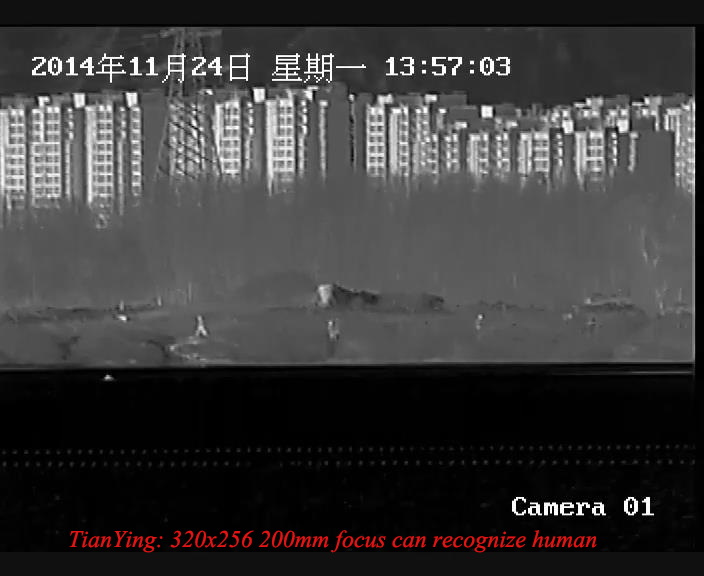 20km(vehicle) in normal weather condition, we already test 750mm focus, 1000mm focus, 1200mm focus, and 1650mm focus 640x512 cooled thermal camera working distance. We manufacture more types thermal core and more types lens. uncooled thermal core have VOx 640x512 17microns detector with 25Hz/30Hz or 50Hz/60Hz, 25mk to 50mk NETD(F1 room temperature), option 320x256 and 384x288 pixels resolution. Lens have 150mm F1, 200mm F1. 250mm F1.1, 45-180mm continuous, 25-250mm continuous, 75-330mm continuous focus etc. Cooled thermal core have MCT 640x512 15microns detector with 50Hz/60Hz or 100Hz/120Hz, 15mk to 25mk NETD ( F4 room temperature), option 320x256 resolution. 60mm/240mm F2, or F4 MWIR dual FOV hardened, coated/sealed germanium lens. 75mm/300mm F2, F3, F4, dual FOV hardened, coated/sealed germanium lens. 30-300mm F4 continuous zoom hardened, coated/sealed germanium lens. 100mm/400mm F2, or F4 dual FOV hardened, coated/sealed germanium lens. 20-400mm F4 continuous zoom hardened, coated/sealed germanium lens. 30mm/150mm/750mm F4 three FOV hardened, coated/sealed germanium lens, detection of man approx 12km and vehicles approx 20km. 80mm-800mm F4 continuous zoom hardened, coated/sealed germanium lens, detection of man approx 12km and vehicles approx 20km. 27.5mm/110mm//440mm/1000mm F4 four FOV hardened, coated/sealed germanium lens, detection of man approx 16km and vehicles approx 21km. 100mm-1000mm F4 continuous zoom hardened, coated/sealed germanium lens, detection of man approx 16km and vehicles approx 21km. 120mm-1200mm F5 continuous zoom hardened, coated/sealed germanium lens, detection of man approx 16km and vehicles approx 21km. 40mm/200mm/1000mm F4 three FOV hardened, coated/sealed germanium lens, detection of man approx 16km and vehicles approx 21km. 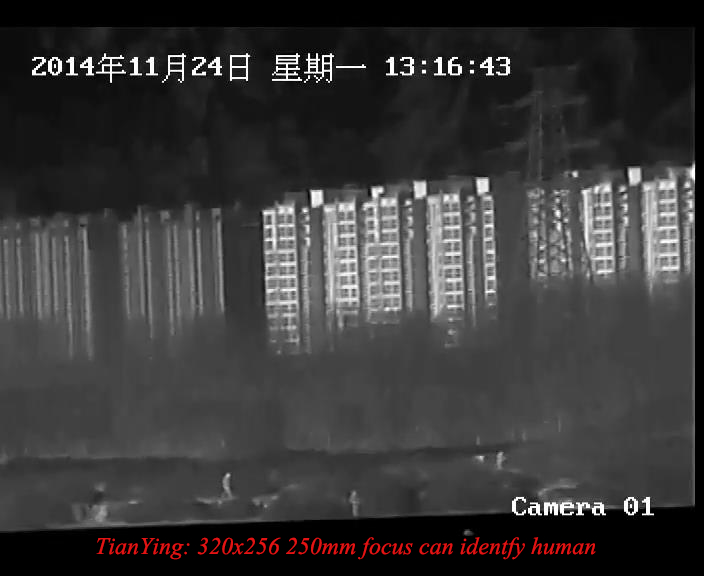 48mm/240mm/1200mm F5 three FOV hardened, coated/sealed germanium lens, detection of man approx 16km and vehicles approx 21km. 54mm/270mm/1350mm F5.5 three FOV hardened, coated/sealed germanium lens.